Tubeway specialise in high quality rigid PVC extrusions, supplied as production runs made to order, or in smaller quantities from our range of stock products. As a by-product of manufacturing at our Ipswich factory, we generate production waste of which more than 95% is recycled as regrind material. This has two obvious benefits, being good from an environmental point of view, and generating decent quality raw material at a cheaper price than virgin material. We are able to pass on the savings generated for certain applications, to the benefit of our customers. 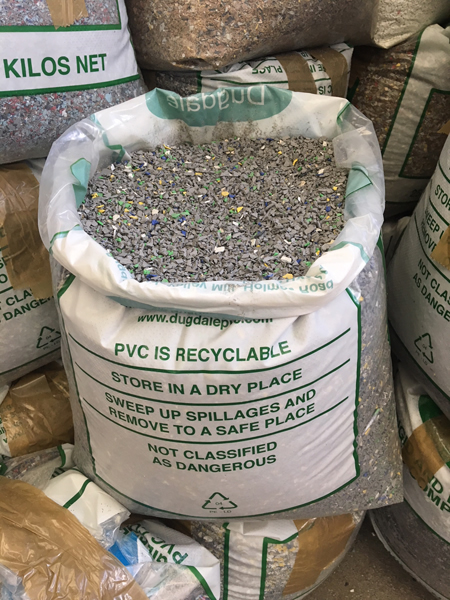 Tubeway never use 3rd party recycled material, as we will have no knowledge of the level of contaminents, or the quality of the material that was first used. In the re-chipping process it is not always possible to separate colours. The mixed "any colour" regrind material that we produce can be used as it comes, resulting in colour changes as profiles are made, and streaking. It is still useful for many applications despite this, although it is possible to use masterbatch colourant to produce consistent dark or black profiles, for a small extra cost. Clear regrind is available, which tends to be a little more brittle than the original material. Note that from an environmental point of view it is possible to recycle products made from regrind uPVC, provided that they do not become too contaminated, and the limitations of the material are acknowledged. If you are looking for a low cost extruded product or component, or wish to discuss whether recycled PVC will be compatible with your particular project, please contact our technical team who will be pleased to advise, and where appropriate, provide pricing.